Sunday July 15, Dan Wendt will present a program at the Boulder Lake Environmental Center on Boulder Lake Reservoir north of Duluth entitled “The Story in Stone: Potential Clues to Early PaleoIndian Lithic Technology”. Dan will explain the information revealed in the pattern of flake scars on stone tools and how archaeologists are using that information to better understand when the tools were made. The program starts at 1 pm. The event is free and open to the public. This is one of a series of public archaeology events a the Center this summer. Next Monday through Wednesday, July 16th, 17th and 18th, Archaeo-Physics and the Otter Tail County Historical Society will present a public archaeology program at Fort Juelson. Fort Juelson was constructed in July of 1876. The public is invited to tour the site or volunteer to assist with archaeological test excavation or ground penetrating radar data collection. 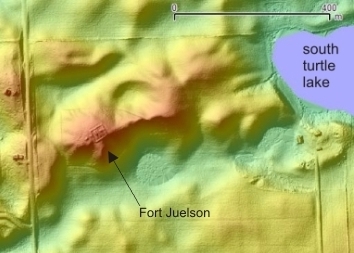 Fort Juelson is located in Otter Tail County, Minnesota, approximately 2 miles east of Underwood off of Highway 210. Turn north on 315th Ave. This collaborative project will include personnel from Archaeo-Physics, the Otter Tail County Historical Society, the Sisseton-Wahpeton Oyate Tribal Historic Preservation Office, the MN Indian Affairs Council, the Minnesota Historical Society, and Courson Archaeological Research. Camping and lodging is available at the nearby Glendalough State Park. Please call Archaeo-Physics at 612.379.0094 for more information about the event.